I’m jet lagged and stalking a shrimp under my bed. The villas at Bambu Indah are re-assembled antique Javanese teak bridal homes…with some adjustments. Ours was put together with glass panels inset between the timbers and positioned over a natural pool. The green glow of the underwater light provides a wonderful night light for us above the glass and a magnet for insects in the water. 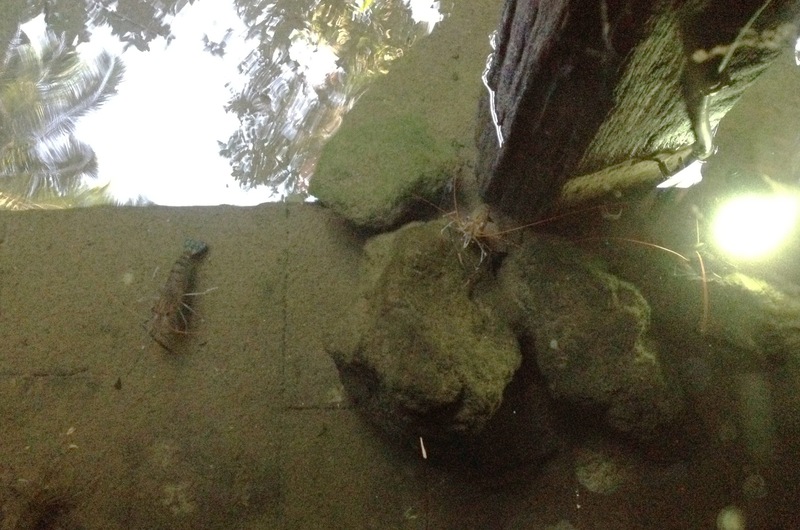 The shrimp have figured it out but are too shy for a picture from above…so far. Bambu Indah is but one testament to the sustainable design philosophy of its founder, John Hardy. Upon arrival to this bamboo architecture oasis, he scootered into the parking lot and had me sit with him to discuss my program and interests. He quickly took some voice memos, sent them to his assistant by his iPhone (in bamboo case), and I had compelling details waiting for me in email by the time I arrived to my room. He moves fast. 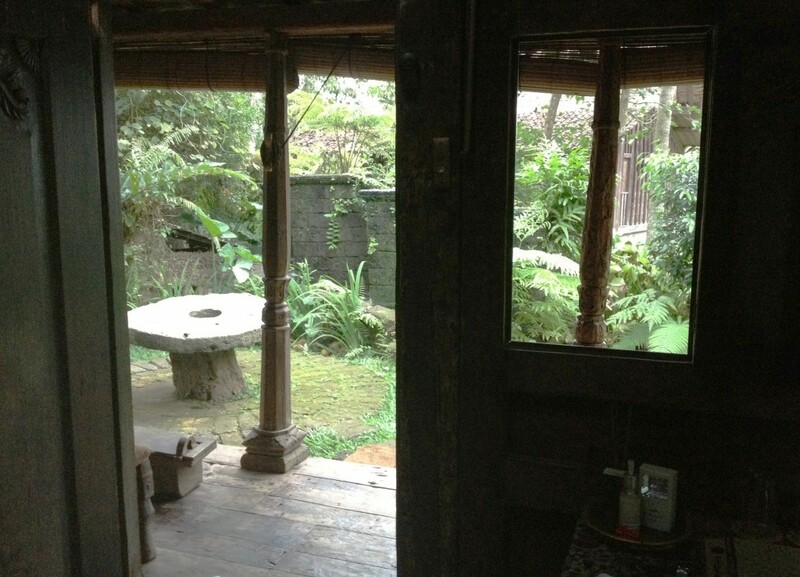 The accommodations at the Udang (shrimp) House are as much outside as inside. Glass tiles allow dappled light in through holes of the thatched roof, and teak panels swing out in a variety of ways to create enough windows as to make the room disappear. The food of the outdoor restaurant is all organic, locally sourced and excellent. In the middle of the small compound is a raised outdoor structure made from black bamboo which serves as a lounge and yoga space. Most of the space between the structures is comprised of running streams and vegetable gardens. I’m hard-pressed to find a piece of plastic in the whole place. John joined Beth and I briefly for dinner conversation which quickly enjoined on Biennale in Venice, Burning Man, INKtalks (the TED of India), and men wearing sanitary napkins. What’s clear is John’s intense commitment to sustainability. We plan to see his Green School and Green Village tomorrow before meeting his talented daughter, Elora. Special thanks are due to Stefan Sagmeister for linking us together. This entry was posted in Eisenhower, Indonesia, Sustainability and tagged architecture, Bali, bamboo, Bambu Indah, Biennale, Burning Man, Elora Hardy, Green School, Green Village, INKtalks, Javanese, John Hardy, Shrimp, sustainability, TED on July 10, 2012 by aly.